Since AX 2012 brought in the concept of models I have been very interested in utilising them to their full potential with our clients and our products. With certain things such as entirely new tables, classes, forms etc, the model concept works very well. It even works well when it comes to individual components on forms or new fields or methods as they are all regarded as individual objects in AX that can be plugged in and out of AX with models. Where things start to become a bit harder is on shared objects such as standard methods etc. So how do we overcome some of these challenges. Hopefully over the next while I will post some useful design patterns and tools that one can use to keep one’s models clean and separated where at all possible. An added bonus of keeping your code separate is that it make performing Cumulative updates or 3rd party updates alot easier as there is less overshadowing. One of the most useful tools for keeping models separate is the new Eventing functionality in Dynamics AX 2012. 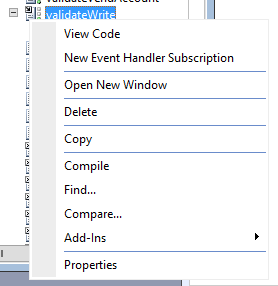 Eventing has a number of benefits, but in regards to model management eventing allows one to keep your code (the event handler method) in a separate model to calling class as well as keeping the event subscription that calls your code in your separate model. 2. Add a new static method to the class e.g. initFromRFQTable that accepts an XppPrePostArgs object as a parameter. Note that this method has access to all the parameters of the PurchTable::initFromRFQTable as well as access to the PurchTable object itself, so you can perform close to anything that you would be able to perform in the method itself. For a direct example look at how Microsoft has done this for localisations on the PurchTable’s initFromVendTableMethod. In the next few weeks I’ll publish more model management tools, tricks and design patterns. If you have any of your own please let me know as well.